When I completed my Bachelor of Education in the late 1990s, we spent a fair amount of time on learning styles. We explored Kolb’s styles (assimilator, diverger, accommodator, converger) and the VARK model (Visual, Auditory, Reading, Kinesthetic), and ones that incorporated relational aspects (social, independent, introvert, extrovert) in a quest to enhance our skills as educators to best meet our future learners’ needs. It was presented as a “keys to success” insight – learn how to teach to each student’s preferred style, learn how to modify your instruction to meet every learner’s need, and all would be good. From the learner’s perspective: figure out how you best learn, seek out learning experiences like that and voila – educational success. We’ve heard this so often, from multiple avenues, that many of us accept it as an established principle rather than theories. (Just do a Google or an Amazon search and hundreds of sites and books will pop up). 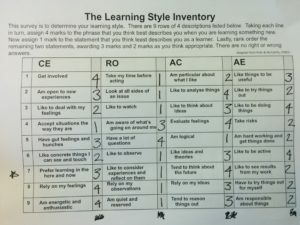 A typical learning style inventory questionnaire and score sheet. Human beings certainly have preferences – in learning and in all things. I really enjoy lectures. I like listening to someone else talk about an interesting topic and share knowledge and insights. I’ve had the pleasure of having some terrific history teachers, for example, who made things come alive in their storytelling. I learned a lot. It was, in fact, an experience with a history course that helped me embrace the learning style message and hold it sacred for many years. I loved history and did really well in my high school courses without, I’ll admit, having to try very hard. Except for the unit on the Napoleonic Wars in Grade 11. I was away that week, at a conference, so instead of being in class for about an hour every day, I had the assigned chapters and the teacher gave me copies of his lecture notes. And I bombed the test. Being an auditory learner explained this. I hadn’t heard Mr. A’s lectures, so I didn’t learn as well. It made me feel better about my barely-passing grade, but was it true? How did I usually learn history? I’d attend the classes (and take notes), read the assigned chapters, and reread my notes to study for the test. How did I do the unit on the Napoleonic wars? I read the assigned chapters and read my teacher’s notes. I actually spent about 50% less time on the unit than any other history unit that year. And I never took my own notes on that unit. Am I really an auditory learner and therefore didn’t test well on something I had to learn differently, or did I spend less time learning this material? Perhaps if I’d read the assigned chapters twice, or taken my own notes, or something else. Auditory learner doesn’t fully account for all variables. Granted, I’m an n=1, but there’s an increasing body of research (with larger cohorts) that points to learning styles being a “myth”. Myth or not, there’s evidence that using a preferred learning style doesn’t lead to more or better learning. For example, Hussman and O’Loughlin (2018) found no correlation between learning styles and course outcomes for anatomy students, regardless of whether the students adapted their studying to align with their preferred learning style. The other message in many of these studies: Context is key. Consider my history/auditory learning example, above. Lecture alone would not have gone over so well in an art history class. I may prefer to learn by listening, but isn’t it better to see the paintings rather than have someone describe them? Likewise, even if all the quizzes tell you that you’re an auditory learner, it’s a good bet that it still makes the most sense to learn about radiology using images. And procedural skills are best learned by actually physically engaging in them. One on-going challenge of the cult of learning styles is it can become an excuse when students don’t master material (“The class didn’t suit my learning style” or “I need to better address students’ learning styles, how do I do that?”). However, a meta-analysis study by Hattie (2012) looked at 150 factors that affect students’ learning and matching teaching techniques to students’ learning styles had an insignificant effect (slightly above zero) (Hattie, 2012:79). It’s good to remember that, as physicians, our students will have to learn and perform in a variety of ways (styles): reading, listening to people, looking at images of some sort or at patients when examining them, and use their tactile senses when examining patients, as some examples. Teaching them in a variety of ways, rather than using narrowly-focused learning style criteria, can only help them achieve this. History lectures are always cool. (They are, but that’s not relevant to this topic, really). My thanks to Dr. Lindsay Davidson, Director of Teaching and Learning, for talking through some of the ideas presented in this post.